Nothing was going to stop Laurier student Nairn Carter from achieving her dream of completing a bachelor’s degree in science. Not a brain injury. Not academic challenges. Not even the loss of her greatest advocate, her mom. On June 14, the 27-year-old Carter will officially graduate from Laurier’s Faculty of Science and receive the degree that proves she is simply unstoppable. Carter is a pediatric brain tumour survivor. Doctors discovered a one-inch mass bleeding from Carter’s left thalamus when she was 11 years old. The tumour, although successfully removed, left Carter with an acquired brain injury that affected her mobility and comprehension. She also developed aphasia, a condition that causes verbal delay when trying to communicate. Tumour-free, Carter had new challenges to overcome. She couldn’t speak, walk on her own, or hold a pencil – a difficult new reality for a child who had always loved school. But nothing stops Nairn Carter. She spent six months in an intensive inpatient program at Holland Bloorview Kids Rehabilitation Hospital in Toronto, working with a team of rehabilitative specialists and studying a modified curriculum at the Bloorview School Authority. Carter rehabilitated well. The tumour left minimal permanent damage to her speech, hearing and cognitive processing. She returned to her elementary school in Kitchener ready to re-join her seventh-grade classmates and start new subjects such as family studies. But her teacher had other plans. He wanted Carter to focus only on core subjects like math and language; but if Carter’s mother consented to the reduced curriculum they recommended, her daughter wouldn’t be able to bake brownies in family studies class. With academic accommodations and her mother’s permission, Carter participated in the full seventh-grade curriculum (family studies included). Carter was eager to start high school in September of 2003, but that quickly turned to frustration when the school’s special education team suggested she register for life skills programming to prepare her to enter the work force immediately after high school. Carter didn’t want to enter the work force right out of high school. She wanted to go to university. Carter’s mother encouraged her to investigate other high schools that would allow her to register in the academic stream. Four years later, Carter graduated from Woodland Christian High School, a private school in Breslau. No, nothing stops Nairn Carter. Carter knew she needed a university that could support her learning needs and limit her physical challenges. The tumour had impaired her gait and caused her to tire easily. Carter’s mom suggested she consider Laurier; Carter could navigate the small Waterloo campus and the school had a good reputation for undergraduate programs and student inclusivity. Carter enrolled in Laurier’s Faculty of Science and received the Dominic Cardillo Entrance Scholarship for full-time students with high academic achievement and leadership qualities. 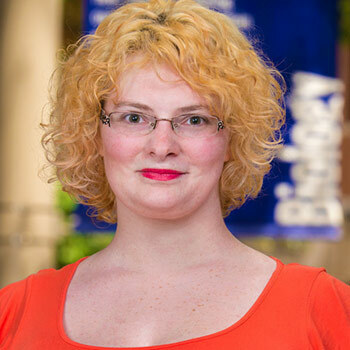 Carter met with her disability consultant, Linda Chamberlain, from Laurier’s Accessible Learning Centre to ensure she would receive the academic supports she required to be successful. Carter was on her way to living her university dream. But the dream started to feel more like a nightmare as Carter struggled to balance her newfound social opportunities with the significant demands of first-year chemistry, physics, and math courses. The coursework piled up and she risked losing her scholarship. Chamberlain recommended that Carter reduce her course load. She did, but still struggled to catch up on missed assignments and readings. It proved to be too much, and Carter was eventually placed on academic probation. Carter withdrew from Laurier to refocus and consider her next steps. But nothing stops Nairn Carter – at least not for long. With encouragement from her mom, Carter enrolled in Conestoga College’s biotechnology technician program. What she didn’t know was that she would have more than readings and course work to deal with. Carter, while visiting a friend in Wisconsin over the December holiday break, hadn’t been able to reach her mother. Her calls went to her mother’s voice mailbox, which quickly filled; email messages were unreturned. Something was wrong. After contacting her cousin to check in on her mom, Carter received the devastating news: her mother had died from a suspected heart attack. Her greatest support, source of encouragement and best friend was gone in an instant. She wouldn’t see Carter complete her diploma. The only child of divorced parents, Carter organized her mother’s final arrangements before starting the final term in her diploma program. After receiving her diploma, Carter returned to Laurier in September of 2014 to continue her dream of completing a science degree. More than ever, Carter knew her school work would require her full attention. She knew it wouldn't be easy, but that had never stopped her before, and it certainly wasn’t going to stop her now. It took her two attempts and 10 years, but Nairn Carter didn’t stop until she finally realized her dream and completed her undergraduate degree studies in April. Carter admits that the reality of completing her degree and achieving her dream hasn’t quite sunk in. Her aunt, her boyfriend, and a long-time friend of her mother’s will watch Carter receive her General Bachelor of Science degree at the Faculty of Science convocation ceremony June 14. Although Carter’s degree doesn’t state it, it’s fair to say the soon-to-be Laurier graduate holds a specialization in sheer determination. After all, nothing stopped Nairn Carter.